The Hainan Women’s Federation launched a series of activities to benefit disadvantaged rural women with breast or cervical cancer during International Women’s Day in south China’s Hainan Province. 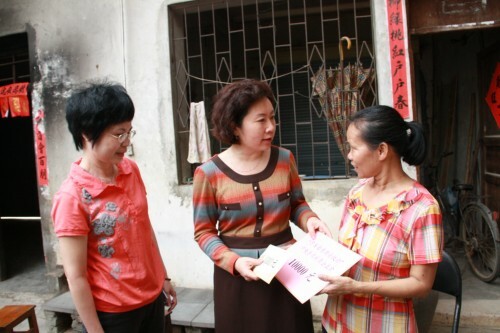 President of Hainan Women’s Federation Liu Jin visited impoverished women with breast or cervical cancer in rural areas and community districts in Haikou, capital of Hainan Province. Liu encouraged them to be brave and optimistic in their fight against cancer, and presented charity funds of 10,000 yuan (US$ 1,610) and other donated items to them. Liu also visited two women with breast cancer and presented them with gift money of 5,000 yuan (US$ 805) and other donated items. The Hainan Women’s Federation and the Chengmei Charity Foundation also made a follow-up inspection of a project that provides support and aid to disadvantaged women suffering from breast or cervical cancer. Vice President of Hainan Women’s Federation Fu Caixiang and Secretary General of the Chengmei Charity Foundation Liu Yingzi visited two women with breast cancer and assessed the project’s current achievements. The All-China Women’s Federation (ACWF), Ministry of Finance and Ministry of Health launched a project in 2009 to provide free breast and cervical cancer screenings to rural women. By the end of 2012, 379,000 rural women from 18 cities and counties in Hainan Province had received free screenings, and the federation had also received two million yuan (US$ 322,000) from the Chengmei Charity Foundation to provide assistance to 462 needy women suffering from breast or cervical cancer.